The medical electronic market is heating up. Device developers are racing to bring products to market in the shortest possible time, while still meeting the requirements of safety, quality and reliability. In addition to their innovation and creativity, developers need to be well informed of compliance requirements such as UL 60601, FDA 501K, ISO 13485 and the like. Medical Electronic Device Solutions magazine is on a mission to uncover the best design and test solutions for our developers. We recently interviewed Chuck Parker, Executive Director of Continua Health Alliance, to learn about their mission and what they do to help the medical industry and ecosystem. The interviewer is our Publisher John Koon. Publisher: Chuck, what is the vision of Continua? Chuck: Continua is an international non-profit open industry organization of healthcare and technology companies joining together in collaboration to improve the quality of personal healthcare. With more than 240 member companies around the world, Continua is dedicated to establishing a system of personal connected health solutions that work together in the home to foster independence, empower individuals and provide the opportunity for personalized health and wellness management. Publisher: What are the biggest healthcare challenges today? Chuck: Today, increasing numbers of adults are overweight and are dealing with chronic conditions, which will directly impact the cost of healthcare worldwide. Publisher: How do you go about solving the problems? Chuck: Continua Health Alliance is building an ecosystem that provides a platform for companies to develop certified products and solutions that work together to enable individuals to better manage their healthcare. Publisher: Who are some of your members? Chuck: We have more than 240 members today including companies such as Cisco, IBM, Nokia and Qualcomm from the technology side, and Aetna and the American Heart Association on the healthcare side, to name a few. Publisher: That sounds good. Do you only focus on the USA? Chuck: No, we work with a variety of organizations in a number of countries to continue to develop global personal connected healthcare solutions. Additionally, we host and attend conferences worldwide to educate companies that may be interested in joining the Alliance. Publisher: You mentioned earlier that keeping healthcare costs down was one of your goals. How do you go about solving that problem? Chuck: Personal connected healthcare solutions allow individuals to monitor their health more frequently, increasing the likelihood that they will notice changes that could lead to more serious health issues before they become emergencies, potentially lowering the rate of costly emergency room visits and increased complications from chronic conditions, a major area of healthcare expense. Healthcare consumers can more easily manage their health from home by accessing electronic personal health data from a variety of Continua Certified devices such as weight scales, blood pressure monitors, personal computers (PCs) and mobile phones. Publisher: Chuck, this is very informative. Our medical technology developers like to be informed of what is important in the industry. We would like to keep in touch with you to learn about new announcements. Chuck: We welcome that opportunity. Charles (Chuck) Parker is the Executive Director of Continua Health Alliance. This membership-driven company focuses on developing an ecosystem of personal connected health care devices. Through working with standards bodies and industry experts, Continua publishes certification standards built upon international criteria from IEEE, HL7, Bluetooth, USB, and others. Chuck leads the many working groups and day-to-day operations of the Alliance. Mr. Parker has over 20 years of experience in health care technology and the strategic design of evaluation and measurement strategies having previously served as Chief Technology Officer and Senior Vice President of Business Development and Marketing at Masspro, one of the United States’ leading performance improvement organizations dedicated to advancing health care quality. Parker holds a Master of Science degree in Healthcare Informatics from Northeastern University and a BA in Communication Studies and Business Management from Texas Tech University in Lubbock. Continua Health Alliance is a non-profit, open industry organization of healthcare and technology companies joining together in collaboration to improve the quality of personal healthcare. With more than 240 member companies around the world, Continua is dedicated to establishing a system of interoperable personal connected health solutions with the knowledge that extending those solutions into the home fosters independence, empowers individuals and provides the opportunity for truly personalized health and wellness management. 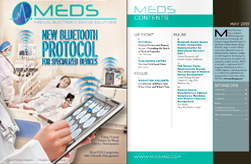 MEDS (Medical Electronic Device Solutions) is a must-read publication for Medical Device Developers. Our vision is to cooperate with leading medical device manufacturers and community groups to educate and promote the best practices to help medical device manufacturers develop and produce the best medical products. We help facilitate the building of medical ecosystems / communities worldwide. www.medsmag.com.